Consumer Reports top overall pick of 2014: the Tesla Model S, of course. The Tesla Model S is finally “recomended” by Consumer Reports. 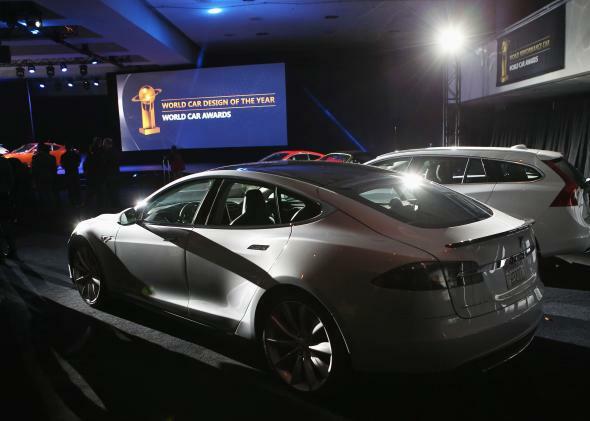 The incomparable Tesla Model S has won just about every car award there is to win, including Motor Trend Car of the Year and Automobile Automobile of the Year. And last year it tied for the highest rating Consumer Reports has ever given, a 99 out of 100. But as I noted at the time, the Consumer Reports honor came with a caveat: It was based only on the magazine’s own tests, and did not include any information about the car’s reliability, because it hadn’t been on the market long enough to come to any conclusions. For that reason, the magazine held off on bestowing the famous red check mark that denotes a “recommended” product. Sure, you can talk about this electric luxury car’s blistering acceleration, razor-sharp handling, compliant ride, and versatile cabin, which can fit a small third-row seat. But that just scratches the surface of this technological tour de force. The Tesla is brimming with innovation. Its massive, easy-to-use 17-inch touch screen controls most functions. And with its totally keyless operation, full Internet access, and ultra-quiet, zero-emission driving experience, the Tesla is a glimpse into a future where cars and computers coexist in seamless harmony. Its 225-mile driving range and 5-hour charges, using Tesla’s special connector, also make it the easiest, most practical, albeit pricey, electric car to live with. That said, it didn’t get perfect marks for reliability. Instead it was rated “average,” which was just enough for the magazine to recommend it. You might think it was docked points for a string of highly publicized battery fires, but that’s not the case, Consumer Reports editor Mike Quincy told me. Every auto brand has recalls, he said, and a few isolated battery fires are unlikely to show up in a broad survey of Tesla drivers. Rather, the car was docked some points for squeaks and rattles, some bugs in its climate-control system, and a few hardware and body issues. On the whole, though, the Model S appears to be holding up pretty well over time—it’s not a car that people find themselves taking to the shop on a regular basis. An average rating is obviously not ideal for a car that costs upwards of $80,000. On the other hand, it’s not bad at all for the first major effort from a brand-new car company using brand-new technology. And it’s a good sign for the quality of Tesla’s workmanship as it embarks on its next big challenges: building an electric SUV scheduled for release in 2015, and a more affordable model a couple years after that. I Took the Tesla Model S on a Road Trip. It Was Nearly Perfect.